Stade Saint-Symphorien is a multi-purpose sports stadium located in the north-eastern city of Metz which is close to the border of Switzerland. Used predominantly for the football matches of FC Metz since opening in 1927, today the ground has a capacity of 26,700 after undergoing expansion in 2001. Stade Saint-Symphorien first opened on September 11th 1923 although it was supposed to open a month before in August if it was not for the roof of the grandstand collapsing. Within a decade of opening Saint-Symphorien was capable of seating 10,000 supporters with approximately 2,000 of these blessed with the luxury of a roof. Located on the banks of both La Moselle and a Canal the stadium was flooded during the Second World War after the local area sustained bomb damage, although it was immediately fixed in the years following 1945. The second half of the 20th century saw FC Metz’ Stadium undergo series of incremental improvements. Floodlights were installed in 1953 in order to facilitate the playing of night-time matches, and the grandstand was once again expanded in 1962. Remaining relatively unchanged for the next 30 years, the record attendance of 28,766 was set on December 7th 1991 when Metz took on Marseille who would go on to be crowned eventual Champions. Although the stadium was not involved in the 1998 World Cup which was hosted by France, it did undergo major renovation work when a three-tiered, 9,000 capacity grandstand was added behind the western goal-end. Three years later, a complimentary one was build on the opposite eastern goal-end resulting in today’s capacity of 26,671. 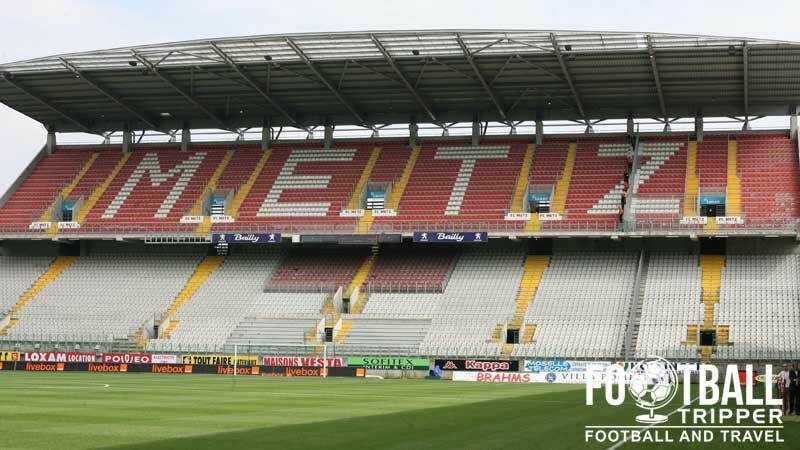 As for the future of Stade Saint-Symphorien it looks like Metz will remain as permanent residents for many years to come, with the football club working in conjunction with the local council to discuss further renovations. There was hope that the stadium could piggyback on the country hosting Euro 2016 but it was not elected as a final venue for the tournament and thus will receive no funding. 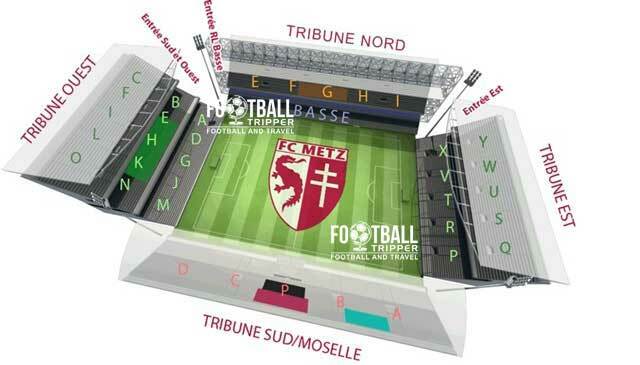 Saint Symphorien is comprised of four stands: Tribune Nord, Tribune Est, Tribune Moselle (Sud) and Tribune Ouest. FC Metz first founded in 1932 after the merger of two amateur clubs making them one of the oldest professional football teams in France. Spending the majority of their history in Ligue 1 – the country’s highest division, the club were relegated in 2006 which resulted in a downward spiral which saw the team plunge to the depths of the Championnat National in 2012. 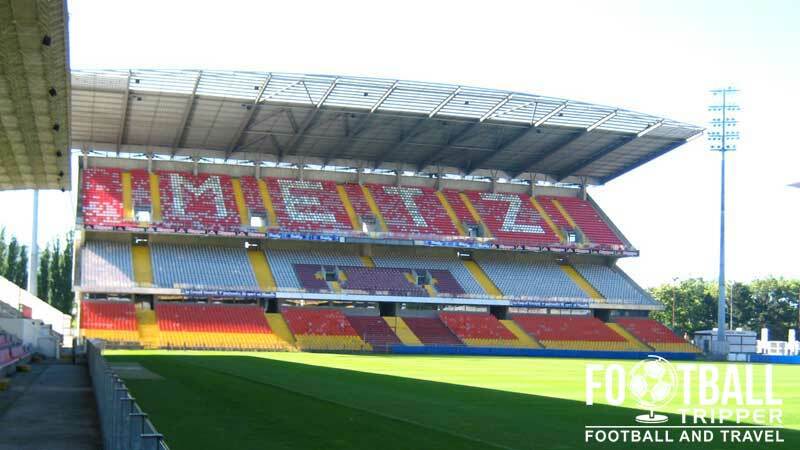 Only recently recovered, FC Metz are famous for having never won a French Championship title with the closest the club came to tasting victory was during the 1997/1998 season when they finished behind fellow underdogs, RC Lens. Before this, the pinnacle of the club’s performance was two Coupe de France victories in the 1980s which resulted in participation in the Cup Winners Cup. The team famously defeated FC Barcelona inn the first-leg in what was one of the biggest upsets in Europe at the time. Today Metz priorities are geared towards re-establishing themselves as a permanent fixture in France’s premier footballing tier. Away fans appear to be housed within the two southernmost sections of seating (Q and P) within the Tribune Est. Tickets for the “zone visiteurs” can reportedly be purchased on the game day up to 1 hour before kick-off. The map outlines three of the most popular pubs amongst football fans within the city of Metz. Although we’ve likely missed quite a few out, it’s a pretty decent starting point! Inside the stadium’s concourses there are over 10 snack bars or kiosks which sell the expected range of matchday grub. Outside the ground’s north-eastern corner, there is an independently run sandwich bar as well as a kebab/chip shop which does a roaring trade on matchdays. If you’re looking for a sit-down restaurant there is the Sport Palace within the north stand. FC Metz operate a club shop located at the stadium in addition to their own official online store. The store at Stade Saint Symphorien is located at the back of the north-stand and is marked by a green carpet and awning which adorns the entrance. It doesn’t appear as if FC Metz or the local council currently offer fans the chance to undertake a tour of the facilities at Stade Saint-Symphorien, apologies. If this changes we’ll be sure to update this section. 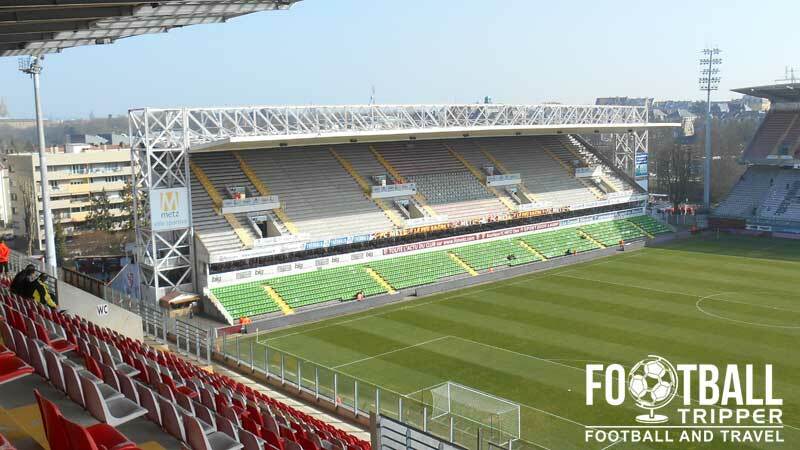 Tickets to see FC Metz in action can be purchased online from the official website, at the ticket office at the stadium which is located in the same building as the club shop, and from other various points throughout the city. Please note that prices vary depending on who the opposition is. Matches against Frances biggest clubs such as OM and PSG usually carry a premium. 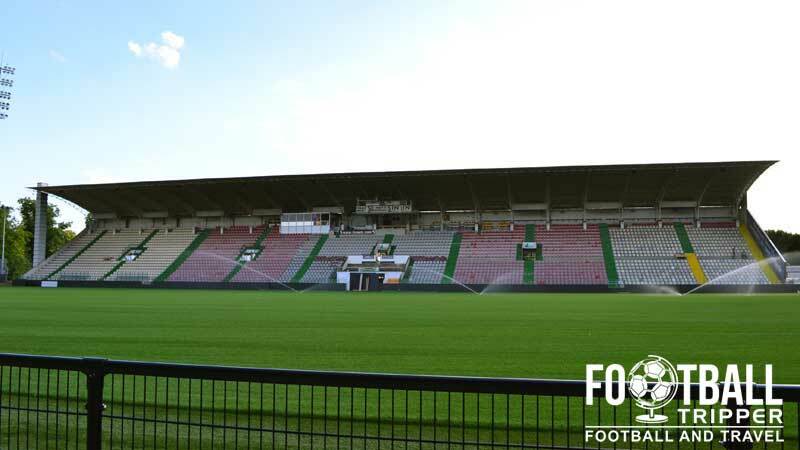 Stade Saint-Symphorien is located on the western bank of the River Moselle and its adjacent canal, less than 2km from the historical city centre of Metz. A view of the exterior of Stade Saint Symphorien from the nearby street corner. On site there is a car park which has room for over 40 buses and 1,000 cars. Available to use on matchdays for a few euros, the largest individual carpark appears to be located south of the ground. The city is served by two stations in total although the main one is known as Gare De Metz-Ville. Located in the city centre approximately 1.8km east of the stadium, you can make the journey by foot within 20 minutes at an average walking pace. Gare du Metz aka Metz Railway Station. Unfortunately we don’t have any information regarding bus times at the moment, but thankfully it is within walkable distance from the city centre. There is a small regional airport which serves both Metz and Nancy however it mainly handles freight and non-commercial traffic. In recent years it has started offering domestic flights to Paris, Lyon and Aligers with Luxembourg Airport often thought of as the de facto International airport – this is 1 hour away by car. There are a good number of hotels within the compact city centre which gives visiting supporters lots of choice. Two affordable choices are the Hotel Ibis and Citotel Alerion Gare – both of which are located right outside the train station.